Whether you are recuperating from a recent surgery, have a spouse that needs more care than you are able to give, or simply recognize that it's getting harder and harder to complete the "routine activities" you are accustomed to, Shell Point Home Care is available to all of our residents. Even when some extra help is needed to ensure health and well-being,many Shell Point residents prefer to remain in the comfort and security of their own environment. That’s why Shell Point Home Care is such an important feature of life at Shell Point.The caring staff of more than 50 screened employees working for the Home Care department are honored to serve those who need a little extra care while remaining in their own setting. Shell Point’s Home Care services have been available for more than ten years, and the staff and services have continued to grow right along with the community. Whether your needs are as simple as a couple hours of companionship, or as complex as 24-hour care, a skilled and dedicated team of nurses, certified nursing assistants and home health aides are available to meet your needs. Flexibility and customized care are key benefits of Shell Point Home Care. As a private service provider not associated with Medicare, Shell Point Home Care is able to offer greater flexibility in the services that can be provided. Additionally, residents do not have to be homebound to receive care. 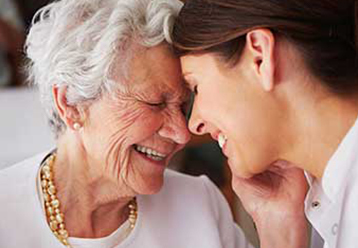 Shell Point Home Care can also adjust the hours of care as needs change. Whether you need assistance with personal hygiene, cooking, shopping, getting to appointments, laundry or household tasks, the experienced staff can help. Home Care is available to residents in independent living, assisted living or skilled nursing, adding that extra touch of comfort, service and care throughout the entire community. If you, your medical team or a family member feel there is a need for some extra care that will assist you in remaining in your home, anyone may make a referral. You do not have to be sick, nor do you need doctor’s orders, to benefit from Shell Point Home Care. When a referral is made, a registered nurse from the Home Care staff will visit you to gather information so a personalized plan can be developed to determine how to best meet your needs. Shell Point Home Care is not part of the Lifecare Plan, nor is it covered by Medicare. Therefore, all customized services are available on a private pay basis. A fee schedule is available upon request. As a Shell Point Home Care client, whether you receive daily care or just periodic care, you will have peace of mind in knowing that caring, competent, RN supervised assistance is just a phone call away. For more information, visit the Shell Point Home Care office on the first floor in the Pavilion Annex of the Larsen Pavilion. Or, you may reach the Home Care team by phone at (239) 454-2242.